Replies: 51 (Who? ), Viewed: 55749 times. #1 13th Feb 2007 at 7:41 PM Last edited by Echo : 10th Sep 2008 at 1:36 PM. Also on this thread you will find my adding glass transparent effects tutorial for download. I was going to merge the two tutorial's together. But i have decided to leave them in seperate files. This tutorial will take you through the process of how to create recolor's by removing parts of the graphics, and so creating the illusion of a see through object. Or if you are successful you can continue to add transparency effects by applying the same technique. D. Please do not publicly critise the technique in this tutorial, if you know of another technique write your own tutorial. Some objects may be too complex for this method. If you do find problems you may have to clone the object and edit the alpha channel or create a new mesh. If you have found this tutorial usefull and have had success, let me know in the thread. And please say thanks. #2 13th Feb 2007 at 7:45 PM Last edited by mike19 : 22nd Feb 2007 at 1:03 PM. Yay, thank you for reposting the tutorial, it has been much needed . #5 23rd Feb 2007 at 8:30 PM Last edited by mike19 : 23rd Feb 2007 at 9:33 PM. where does that bed come from? at the moment all i can say is it must be something you havent got right. as i just checked in my screen shot. 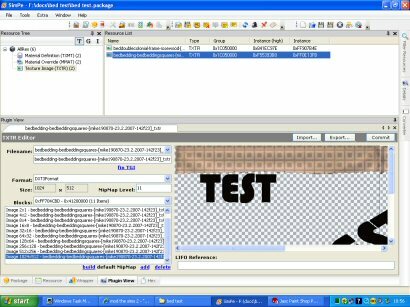 if you edit a beding texture from an original in game bed then the texture is applied to all beds includeing custom beds. also i notice the colour in your screen shot is still there last time i got the dxt incorect it showed up on the game black not with the original colors. 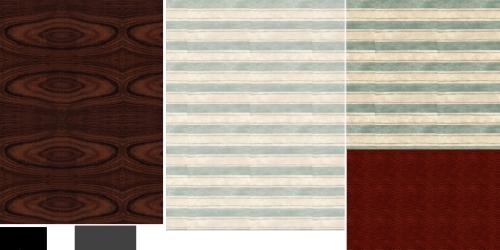 have you recolored the texture correctly and did you get a checkerboard effect? i know it appears in paint shop pro but it may depend on what you used to edit the texture. Please dont upload my creations to paysites. I have changed the stdMatAlphaBlendMode in Blend to create a trasparent blanket. That happens with multi-subset objects. They dont support transperancy, except only when using the material definition (not a texture). #8 24th Feb 2007 at 6:04 PM Last edited by mike19 : 25th Feb 2007 at 1:03 AM. i'm afraid it does look like you cant edit the texture in that object. 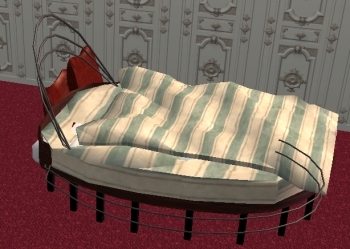 the beds that i tested on have a seperate texture for the bedding. 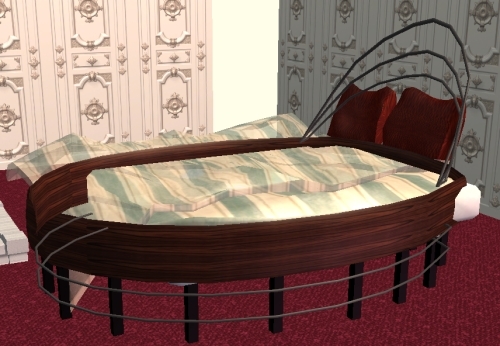 the bed and legs etc are in another seperate texture. Some objects may be too complex for this method. If you do find problems you may have to clone the object and edit the alpha channel. but as this seems to be a new object your using and not a clone from a game version i dont know you will get any where with it. I create this bed by clone object. I would like create a trasparent blanket. Is not possible? Maybe, us they must be a different part of object...as an example , the bed i'ts composite of two part of objectm frame and bedding, but it's usable only frame, because bedding it's s part of animation. you normally need at least two seperate textures, 1 for the bed and another for the bed sheets, from the the texture you have shown it looks like it only has one texture for the bed and bed sheets. have a look at the screenshots of the test bed i made it shows the texture for the bed and a texture for the beding. if you do only have one texture perhaps you need to change it so it will have two so it will only be the bed sheets you edit. #11 26th Feb 2007 at 12:01 PM Last edited by kihaad : 26th Feb 2007 at 12:09 PM. I have tried to make therefore: There are two part of an object, in one I use ONLY texture without trasparent , in two I modify the material definion in Blend, for trasparent. But I have however the problem that I have made to see. I see many site that they succeeded to make it. In the example of the bed , I cannot make what you have said , because the the blanket is part of the first group of objects. I have read that it must modify the alpha channel, there is a tutorial? #12 26th Feb 2007 at 10:20 PM Last edited by mike19 : 28th Feb 2007 at 12:20 PM. then we may get past what neither of us understand, be it down to language or the tutorial. or if you have seen success in other objects have a look at them with SimPE and see what was done. if it's any consulation before i worked out this tutorials technique i originally took 3 weeks to make my first transparent/see through object as there was no tutorial or advice available and thats what prompted me to write what i know. there is claimed to be other way's but mine is what i can deal with it's not fool proof and i am happy to help as much possible. it's awfull by comparison now, but i made it and it still gets downloads now and then. I started doing your transparency tutorial last night but still can't get to the recoloring stage. I do not get the Generic RCOL Editor up in the Plug In window like you show so I can't select "Blend". I've checked all over the SimPE site and even downloaded and printed out manuals and tutorials for SimPE but nowhere do I see how to get this RCOL editor. I've even reinstalled SimPE but still don't see it. What do I have to do in my graphic editor to get the checkerboard effect? #16 28th Mar 2007 at 1:09 AM Last edited by mike19 : 28th Mar 2007 at 10:58 AM. if you are using paintshop pro you will see the checkerboard effect if you are using another programme then as long as you have followed the tutorial then you should have no problem. regardless of the programme you use. any programme that can handle the png format and transparency will be ok. I thought I had it all figured out! lol Somehow the two smaller versions of this curtain turned out just fine, but why did it make the double one look inside out? i'm not sure what you mean. I can't see a problem. Or maybe i need new galssses. Without spending the next hour experimenting and trying to duplicate what you have done i cant give an answer with the info so far. Thanks for the tutorial. I might use this a lot. curtains like windows can be placed from both sides of the wall, may ensure they're placed from the same side. I've tried again with the same results. Maybe this picture will display my problem a little better. I used the Floor Length Tie back curtains knowing that the texture is lended to the Sill Length and Doublewide as well. The floor length and sill length turn out just fine, but the doublewide looks like the swag portion is behind the sheers instead of in front. Any ideas why? The upper piece of the 2-tiled curtain is meshed differently from the 1-tiled one. I also think mike's suggestion is a neat one. As for some unmapped region of a mesh, one may try the StdMatCullMode none. Either add or edit the line "StdMatCullMode" to be "none" @ the txmt file. This can be tried on this instance to see if anything happens, too. I'm unsure tho. Mike, that sort of defeats the idea of making sheers, yes? 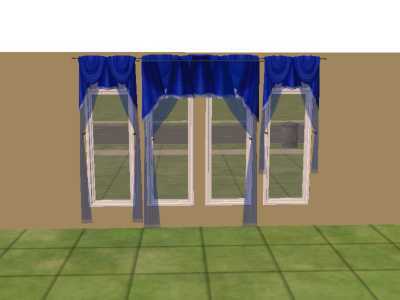 There is a problem in general with using the 'blend' setting, which is that pieces that overlap each other with blend sometimes will display as these curtains are - something about the order of how the pieces were made will change how they display in game. 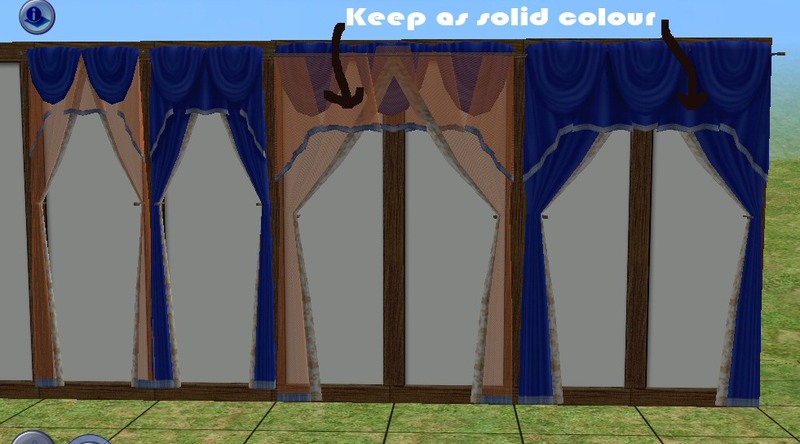 Unless you made the curtains mesh and thus can remake it Crissie, I think those curtains will have to not use blend. and then keep everything solid and erase the parts you don't want to show (if it's a png) That setting will work with objects where blend makes a mess.